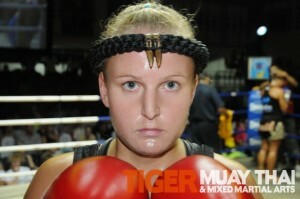 Tiger Muay Thai and MMA raining camp fighters racked up a 3-2 record over two nights of Thai boxing fights in Phuket, Thailand on October 7 and 11 at patong Muay Thai Stadium and Bangla Thai Boxing Stadium. Samson, Jonny, and Chelsea all scored KO’s in their fights. Chelsea scored an impressive 5 second KO in her first fight as she came out against her veteran Thai opponent and landed a heavy overhand left then followed with a solid knee breaking her opponent’s nose and dropping her in a heap in the corner. Jonny continued to look good in his return to the Thai boxing ring as he scored a hard fought 3rd round KO bringing his record to 2-0 in his Muay Thai return. On the losing side, Anna lost her rematch against Gerri on points over 5 rounds and Fakanong lost his fight on points over five round.